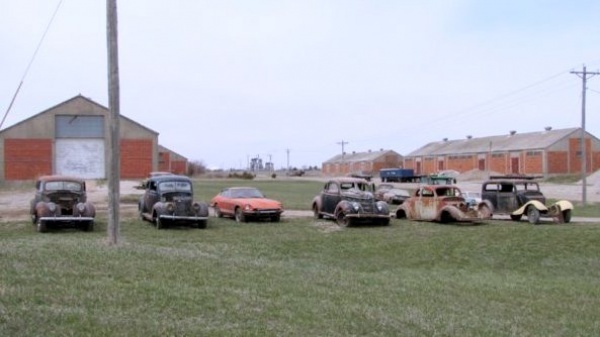 This collection of over a 120 classic cars was discovered hiding in an old arsenal building in Hastings, Nebraska. 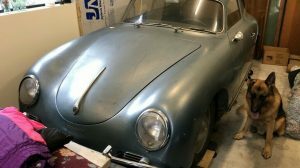 The collection is composed primarily of ’40s and ’50s American iron, but there are a few cars from the ’60s and ’70s as well. 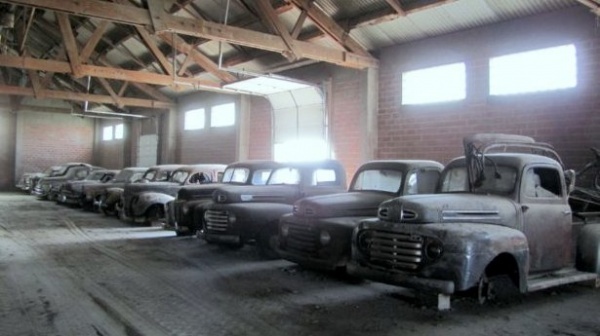 This massive collection is being auctioned off by VanDerBrink Auctions on July 20th. If you can’t make it for the auction, you can bid here on ProxiBid. Special thanks to Jim S. for sharing another great find with us! 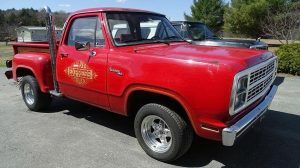 This collection has something for everyone, from trucks to sedans and even a couple of muscle cars. 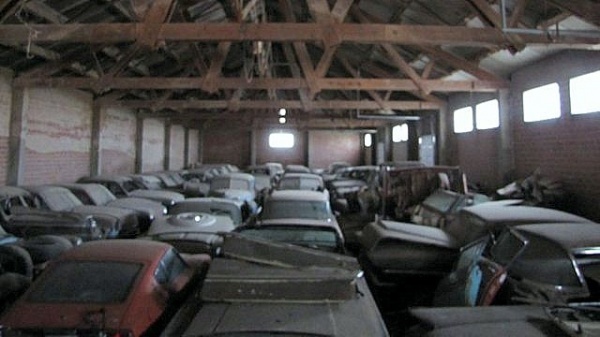 As you can see, most of the cars in this collection are in rough shape and missing components. The auction house didn’t offer any history on this collection, but perhaps one of you knows more about how it came to be. In preparation for the auction, the auction house has pulled most of the cars from their resting places and parked them outside. While most of the cars are American, there are a couple foreigners in the mix, including an orange Nissan 280Z. While a large number of these cars were parked inside, many appear to have been outside for a number of years. 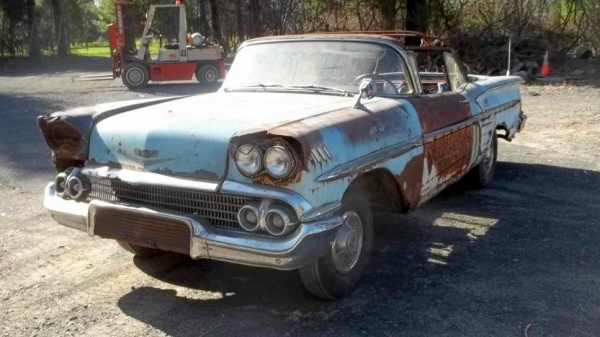 Given the condition of most of these cars, it seems likely that this was at one time a salvage yard where the owner parked the stuff they liked inside and left everything else outside. 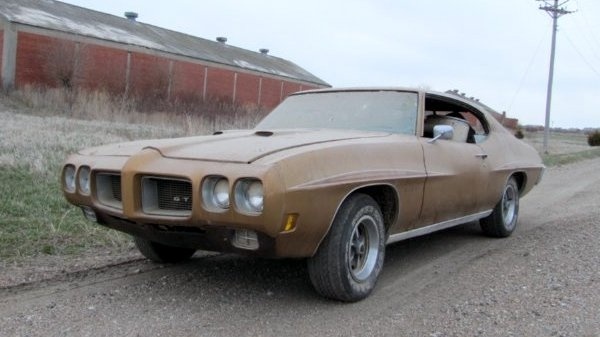 This collection includes a couple of desirable muscle cars, including a 1970 Pontiac GTO and a 1968 Mercury Cougar GT-E. 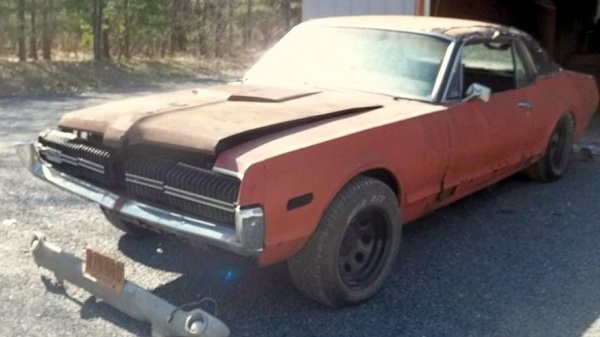 The Cougar is one of only 357 built and came from the factory with a 390 hp 427. Most of the cars in this collection should go cheap, but a few will draw serious attention. If you’re in the Hastings area in July, be sure to stop by and take a look. My theory, based on absolutely no facts at all, is that space in the former arsenal was cheap to rent and this is connected with the resolution of someone’s estate. Pure speculation, of course. Too bad they’re mostly junkers. Love that GTO coupe though!! Almost all the cars are from Nebraska & Kansas. The owner has been collecting them for about 5 years. I see several cars I have sold to him he has a body shop in New York state and comes here about twice a year. A few cars are stored in Kansas and New York. Owner is a personal friend. all will sell to highest bidder so bring your trailer. 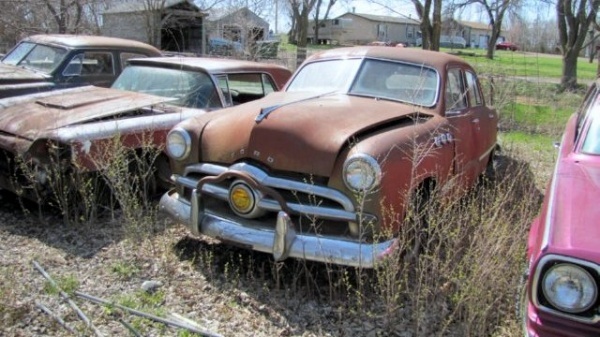 Lots of mid-’50s Ford & GM ones there, plus some nice old pickup projects. I’ve always wanted a Ford Crestline with the plexiglas roof, and there’s also a Nomad. With just a handfull of exceptions, it’s all old timers and not much muscle. I don’t know who put this group together, but I’m guessing he was probably not a teenager between the years 1964 – 1973. Anyone who goes: it would be great to see a few pics of some of the more interesting ones. And good luck to anyone who makes the trip to bid. I hope they get what they’ve always wanted. I’ve driven by those arsenal building at least a dozen time while heading to Motorsports Park Hastings. Hasting is one car crazy town! If that’s a real GTE, that’s a find! GTE’s had specific side trim and emblems that I don’t see on this one. All area where the GTE emblems would be are stripped! Sent the link to the GT-E registrar to look at. Should have a GT-E 7 Litre emblem right behind the front wheels and chrome trim around the wheel wells and down the side of the door. I have one of the 427’s stored! Awesome car! First GT-E ever auctioned off recently sold for over $100K completely restored. If this IS a GT-E and it is NOT an XR-7, it is even more rare! only 101 built! After looking at the VIN and photos, it is a real GT-E! Poor thing needs a good home and a LOT of care! Hope the orig 427 is still in it! Being an XR-7, it is actually one of 256 built!! Was even the same original color as mine! Sad….Hope someone takes it and fixes it! Maybe little Yvette should have recruited the help of a real ‘car guy’. She mis-spelled the first car on the list. Pages and pages of them, but yet not enough and orderly enough to get a good impression of each car. I think this will discourage any online bidding, and who wants to drive all the way to Nebraska ?? You got to go another route with that like click o line auctions….site loads slow…but check out “results” to see past auctions in this area (my part of the country). I’ve spent along time at this site and it’s tricky….try another less intuitive route and you’ll get there. Be forewarned, this site does not spend along time detailing the car with accurate write ups. I noticed the “Pontiac” Fury. The text description for each car would be lengthy. There will be few pictures a very short description of each car on proxibid. 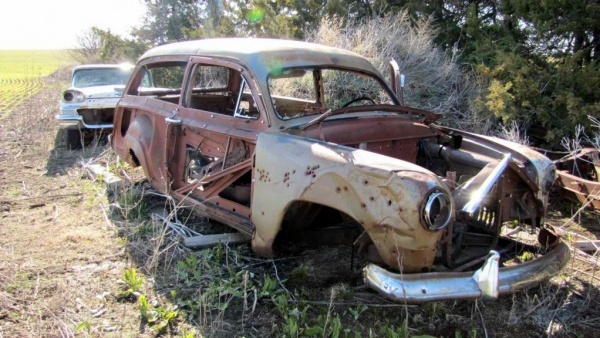 A few can be restored but most cars are incomplete and for parts. 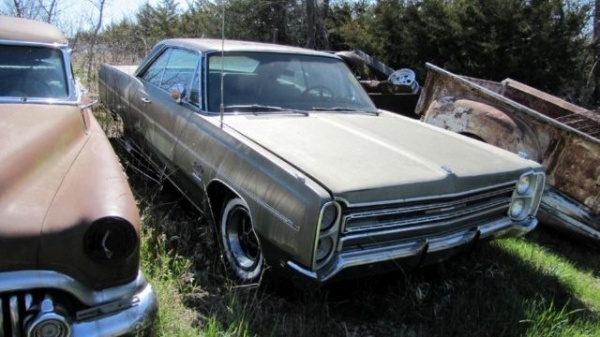 VanDerBrink Auctions are well known for old car and machinery auctions and have a large following. I don’t expect there are going to be many buyers from the east or west coast but there are a lot of collectors a lot closer. Like Bryan Cohn said Hasting is one car crazy town! Should be a fun sale to attend. Could be very easily something for everyone there thats a car nut . 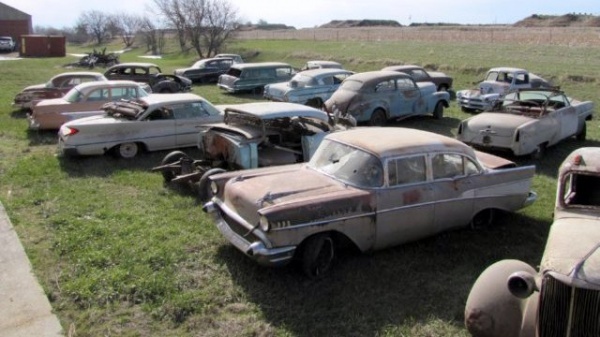 When we get to heaven these will all be drivers… they will have the keys in them, just park them when your done driving. I hope they’re not all drivers on the other side. I love restoring as well and I’m going to still want to get rust in my eyes when I tear one of those gems down. I just visited with one of the four owners of “The Hastings Collection.” He was in town handing out sale bills. 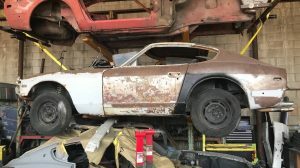 These are some pretty amazing project and parts cars, a few are drivers. This will be a huge event. 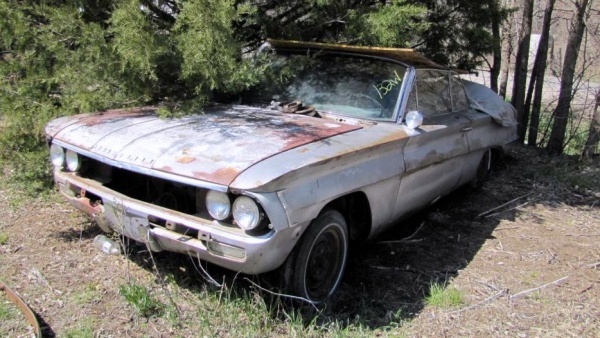 This auction comes in the midst of the 26th Annual Cruise-Nite in Kearney (43 miles northwest of Hastings on I-80). Come on “up” and see more than 500 cars downtown or another 170 in the air conditioned comfort of the Classic Car Collection. Central Nebraska is one car crazy location! 2) Find on the right below “Upcoming Auctions” a green box “CLICK HERE FOR ALL LISTINGS” (click on that). This shows four auctions coming up. Click the far right green box “ONLINE AUCTION”. And prepare to wait for about a ten second load time. 3) After the brief load time, you’ll see 3 auctions and to the right it says “8 Days 14 Hours” in blue….and below “22 Days 14 Hours”…etc. Notice at the bottom on the left it says in gray “Show archived events”. THIS IS WHERE YOU WANT TO GO to see about 15 other auctions, prices, the car photos, and a brief description. Click “Show archived events”. Wait for a ten second load time. 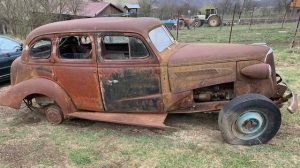 Now you can review 30 older auctions with photo, price at auction, and description of the vehicle. This part of the site, is worth your trouble, I think. Shows you small town midwestern auction prices that can be compared to our usual ebay, Craigslist info dump.